Thomas D. "Tom" Dillant was born in Keene, New Hampshire in 1920. 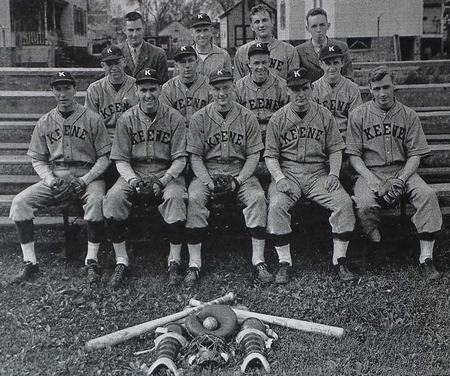 He played baseball at Keene High School and was on the varsity team at Keene Teachers College (now Keene State College), winning the New England Teachers' College Conference championship in 1939. Dillant was part of the Civilian Pilot Training Group at Keene in 1939 and when he entered military service in 1941, it was with the Army Air Corps. Dillant trained as a fighter pilot, and was commissioned a second lieutenant at Foster Field, Victoria, Texas in February 1942. On March 17, 1942, Second Lieutenant Dillant was on a routine flight with the 77th Pursuit Squadron, 20th Pursuit Group when he lost his life attempting an emergency landing at sea in a Bell P-39F Airacobra near Myrtle Beach Army Air Field in South Carolina. He was 25 years old. "The first death [of a Keene student] was particularly hard to take," wrote James G. Smart in Striving: Keene Sate College 1909/1984. "A Keene native, he had been in many school musicals, had been a catcher for the baseball team, and had been president of his class. He had civilian pilot training here, and was killed in a forced landing off Myrtle Beach, South Carolina. The last words to his class (1941) were: 'Let education be every man's lantern, common sense his path, and success will be his destiny.' It is often said that war draws off from a country its best blood and brains. It seemed to be true. His memorial was the airport in North Swanzey dedicated to him and Edwin Hopkins, the first Swanzey youth to die in uniform." Dillant-Hopkins Airport, dedicated October 31, 1943, is still in operation.